The best way to determine what size Flute pads you need is to examine the original flute pads that were removed from the flute, assuming they were the correct size to begin with. Measure the face of each flute pad with a ruler or, if possible, a set of Digital Calipers. Then measure the thickness of the flute pads. If the new flute pads are not identical to the original flute pads (especially in thickness), it will make the new flute pad installation process much more difficult. Excessive time will also be spent (unnecessarily) bending keys to attempt to make the new flute pads work, so do your best to choose the correct new flute pad sizes! 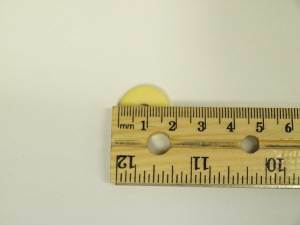 The general rule for sizing pads is that you can go .5mm smaller in diameter and be fine, but you cannot be too big. So if you are in doubt, choose a flute pad size that is .5mm smaller. New flute pads that are too thin can be easily shimmed with Instrument Clinic flute pad shims, or you can cut your own using newspaper. If your new flute pads are too thick, it's best to order thinner new flute pads. It can be frustrating for the beginner to learn how to measure flute pads, since they are not always EXACTLY the size you are expecting. Measuring flute pads can take a little patience and practice. Please expect the flute pads to measure "close" to a given size. 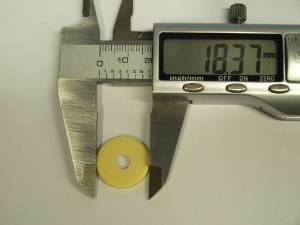 For example, a 15MM pad might measure at 14.91MM, or 15.02MM. When using a set of digital calipers, a tiny movement can give you a different reading (especially since the pads are soft).